No, this isn't a late April Fools joke from Google, this is a completely real thing - Google engineers have developed a cardboard viewer that lets you hold your phone to your face and simulate a virtual reality headset. The app and companion viewer are called Google Cardboard; it was borne out of a 20% time project at Google; and, Sundar Pichai showed it off during the Google I/O keynote. The idea is fairly simple: virtual reality headsets are usually very expensive and difficult to make, but maybe there's a simpler way. Much simpler in fact. The whole setup only requires five items, four of which are very easy to come by. Google has posted the instructions so you can take some cardboard, velcro, magnets, rubber bands, and lenses to make your own VR headset. The lenses are the most difficult part to get, and the whole setup would cost about $50 to build. Once you have your headset built, you can download the Cardboard app which will display content split on the phone display so you see it as a single image through the headset. To start out, the app will be able to fly you around in Google Earth, take you on a tour of a famous place like Versailles, study art works from all angles, take a Street Vue trip, look at a photo sphere that you've shot, or experience the Windy Day story. Wait I just realized something...Their's no head strap, so your going to have to hold that box the whole time!? No thanks.. Looks ridiculous too but I do applaud Google for looking for cheaper alternatives! Yeah because the missing strap is what makes someone with one on look ridiculous. 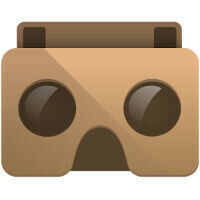 lol its absolutly damn cool i just buy it from googlecardboard.com and i am loving it . It's good to see new things are being tried, and I hate to say it but, thinking outside the box. I'm sure a company will make one for about $80 soon enough. The first creation is always rough, it will only become more refined as it goes on. It would be cool to see a type of lens that would clip onto google glass, maybe be bluetooth. When sundar pichai say that each of the attendee got cardboard, i thought it was a joke. Does this come with an official Google "Kick Me" T-shirt or do I have to purchase that separately.